Alternative nitrogen systems could be one tool used to address nitrogen overload in ponds. Hidden away at the Otis Air National Guard Base in Buzzards Bay is the country’s largest alternative septic system test center. On a recent morning, raw sewage trickled through a shallow trench, feeding about 15 different septic systems scattered in a field, each one accompanied by a small shack with a monitoring station. 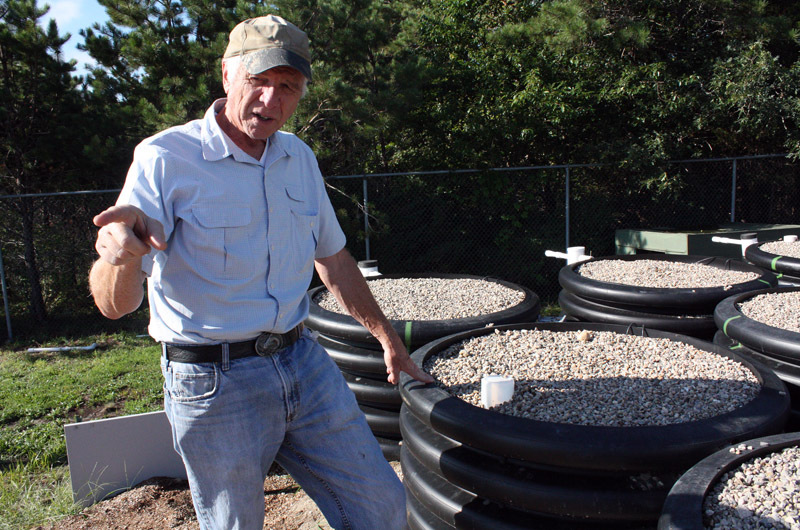 George Heufelder, director of the Massachusetts Alternative Septic System Test Center, stood beside the trench in jeans and a battered baseball cap, explaining how the wastewater — about 250,000 gallons per day — is controlled to mimic household usage, with most of the flow in the morning and evening. The system can also simulate a home with working parents, with no flow in the day; or washday stresses, as when a family returns from vacation. “We try to simulate all those stress tests along with doing the standard protocol,” said Mr. Heufelder, who tests each design according to National Sanitation Foundation standards. He also heads the Barnstable County department of health and environment, which monitors about 18,000 alternative/innovative (I/A) septic systems from Woods Hole to Provincetown. I/A systems on the Cape remove about 50 per cent of the nitrogen in wastewater about 77 per cent of the time, Mr. Heufelder said. But the totals vary considerably. As many as 300 systems are installed on the Vineyard, mostly in Edgartown and Oak Bluffs, where there are more small lots in limited nitrogen areas. Most people pursue alternative systems for their regulatory benefits such as nitrogen credits that allow for more bedrooms. But the technology could also help achieve more widespread nitrogen mitigation. Too much nitrogen can cause algal blooms that have impaired all of the coastal ponds in the commonwealth to some degree. Along with expanded sewering and other measures, I/A systems are one option for reducing the amount of nitrogen entering a watershed. But they present a high hurdle, with regular maintenance costs and the shifting dynamics of a resort community. Each system is essentially a miniature version of a wastewater treatment plant, with complex biological processes and moving parts that require regular maintenance. Wastewater enters a chamber where solids settle to the bottom, and grease and other material collects on the surface, with watery effluent in between. Aerobic bacteria in the tank convert ammonia into nitrate. The process usually continues in a leach field, where wood chips or other carbon-rich materials provide food for anaerobic bacteria to convert the nitrate into nitrogen gas. Conventional septic systems, as regulated by Title 5 of the state environmental code, are not designed to remove nitrogen. Many I/A systems are still in development, but the state will allow them to be installed, as long as developers or property owners have the required approvals and the property can also handle a conventional system in case of failure. A state department dedicated to I/A systems dissolved several years ago, and oversight shifted to local boards of health, which now approve and monitor all I/A systems. The Edgartown board of health monitors about 150 systems, many of which are in nitrogen sensitive areas or near municipal wells. Oak Bluffs has at least 100. West Tisbury has about 10 systems, while Tisbury has about 25. Chilmark has 13, in addition to 13 composting toilets. Aquinnah has about five systems, not including tribal housing. Mr. Heufelder has offered to extend his county’s database program, known as Carmody, to Island boards of health, but so far only Oak Bluffs has taken up the offer. Barnstable County charges vendors for maintenance visits and then publishes the data online. Mr. Heufelder believes the system allow for more efficient monitoring and maintenance in the region, especially as communities begin implementing nitrogen mitigation techniques. 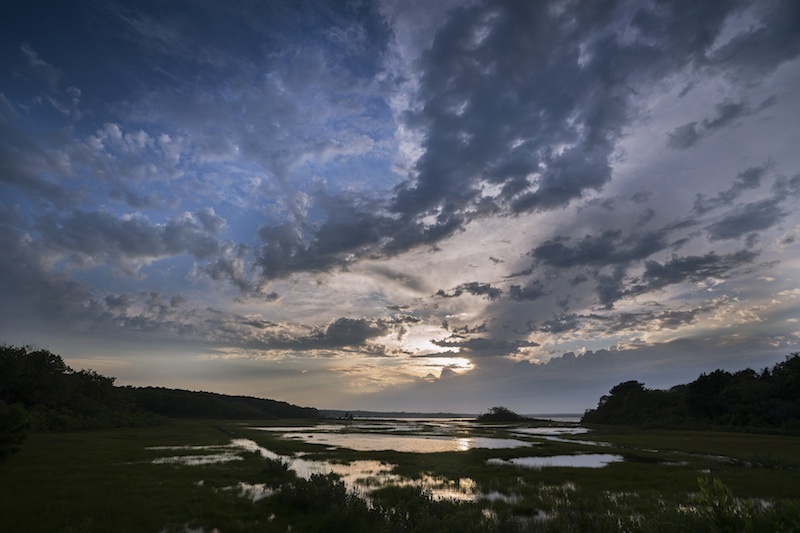 The Massachusetts Estuaries Project (MEP), a partnership between the Department of Environmental Protection and the University of Massachusetts, has provided nitrogen reduction goals for most of the coastal ponds in the state, including all but a handful on the Vineyard. Carmody could play a bigger role in tracking the mitigation in each watershed, especially if the DEP decides to mandate the reductions, as many believe it will. The Martha’s Vineyard Commission has required about 15 I/A systems for new developments since 2006, after the numbers began coming in from the estuaries project. MVC wastewater planner Sheri Caseau stressed the importance of tracking as the Island begins to implement solutions. Based on an assumption that full-strength waste contains 40 milligrams of nitrogen per liter, I/A systems are thought to remove about 50 per cent of the nitrogen in wastewater, or about 19 milligrams per liter. Mr. Heufelder believes that in watersheds requiring up to a 50 per cent reduction in nitrogen, I/A systems alone could potentially solve the problem, but only if every household in the watershed had one and every system worked as advertised. Based on available MEP reports, nitrogen reduction goals on the Island vary from between about 17 per cent for Edgartown Great Pond to 64 per cent for Major’s Cove in Sengekontacket Pond. The Lagoon Pond requires a 34.6 per cent reduction. In many cases, meeting the targets will likely require a mix of solutions. Many I/A systems fail to meet the 19 milligram target. In Edgartown, fewer than half the systems achieved a 20 per cent reduction this year. “They absolutely contribute to the solution,” Edgartown health agent Matt Poole said this week. “But my experience is also that they fall short of the mark.” The Edgartown board of health recognizes only a 25 per cent nitrogen reduction for I/A systems, which also limits the benefits of nitrogen credits. Some argue that with constant energy use and the travel time required for inspections, the environmental costs and benefits simply cancel each other out. And nitrogen credits typically allow homeowners to increase the number of bedrooms per square feet of land, as provided under Title 5, which translates into more water use, if not larger houses. I/A systems typically fail not as a result of poor quality, but of improper maintenance. “It takes a little more care and remembering and attention than just push the button and it disappears,” said Chilmark health agent Marina Lent, who generally encourages I/A systems. Each system requires a service contract with quarterly or biannual inspections. Few people in Edgartown maintain the systems as they should, said Mr. Poole, leading to frequent noncompliance. A service contract is usually around $1,000 annually for seasonal homes, and more for year round homes, whose systems allow for more inspections during the year. Electricity costs on the Vineyard may add another $40 to $60 per month to the cost of an alternative system. “People underestimate what cost is going to do to a family budget over time,” Mr. Poole said. “Suddenly what seemed somewhat doable becomes less doable.” When a system falls out of compliance, a board of health has to step in. The number of systems out of compliance in Edgartown may range from 10 to 50, Mr. Poole said. One benefit of I/A systems is their ability to serve homes in rural areas, where sewering would be impractical. But many of those homes on the Vineyard are seasonally occupied, which presents another challenge, since the bacteria in a septic tank will die without a constant food source. In at least one case, the MVC has required that a seasonal development include a septic maintenance plan for periods of disuse. Houses that share a system may have better luck with the seasonal shift, since the flow would likely continue even if someone went away. Shared systems may also have smaller footprints than separate units, and lower maintenance costs. But homeowners often dread the complicated legal agreements that come with sharing. “It’s not common anywhere on Martha’s Vineyard that I know of,” said Mr. Poole, citing only one example in Edgartown where two houses share a system. “Let’s face it,” said Mr. Heufelder. “Most people do not want to deal with this stuff at all. They just want to flush and go.” Composting toilets would probably be the easiest solution, he said, since they can remove up to 90 per cent of the nitrogen in human waste. But people have problems with those too. An incentive program on the Cape that provided homeowners $5,000 and a 20-year zero-interest loan to install composting toilets made little headway. “I think we got two takers,” Mr. Heufelder said, adding that installation costs for a two-story house range from $10,000 to $15,000. 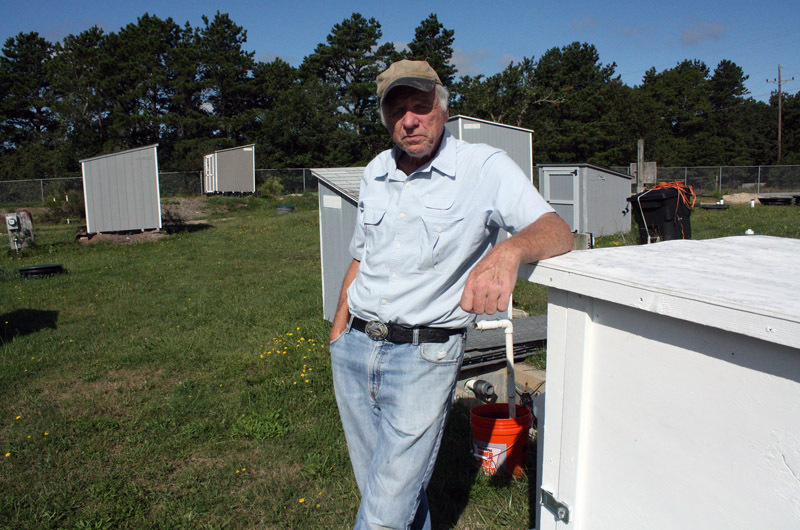 “Most people don’t like the idea of having an outhouse in their house,” he said. 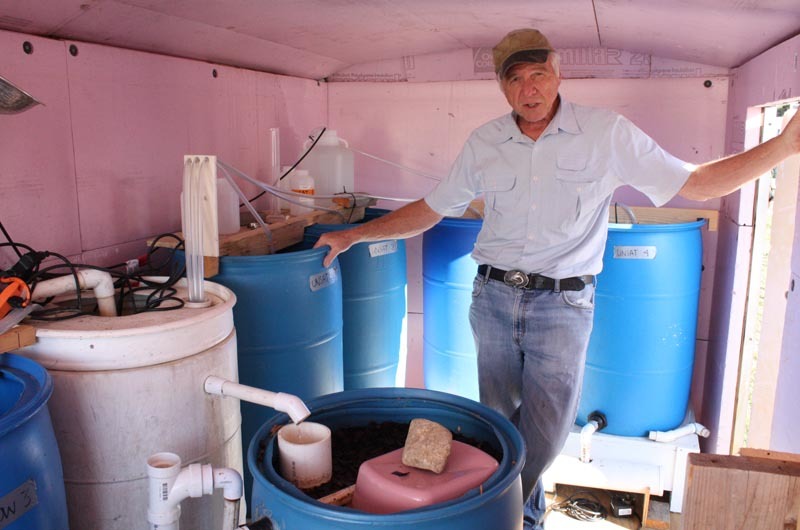 But in watersheds requiring up to a 70 per cent nitrogen load reduction, he believed composting toilets could do the job. For whatever reason, composting toilets have been better received on the Vineyard, with about 50 installations, beginning in Chilmark in 1978. All 17 buildings at Island Cohousing in West Tisbury have composting toilets, which typically allow for a downsized septic system. The new West Tisbury Library has two units. He believed a similar approach might create some balance on the Vineyard between year-round communities and the larger, more scattered residences up-Island, where sewering and I/A systems will be more problematic. Relying on year-round residents to solve the problem “is fundamentally unfair,” Mr. Thompson said. Many anticipate that the state Department of Environmental Protection will eventually mandate the MEP thresholds for each pond, leaving towns and communities to come up with their own solutions. It won’t matter how communities do it, Mr. Heufelder said, but they will need to show the proof, and that will require monitoring. Search "Aerobic Septic Systems". They have been around since 1955 in Texas and other states. Some claim 90% efficiency before the water is used on the lawn.